FABULOUS FIND! 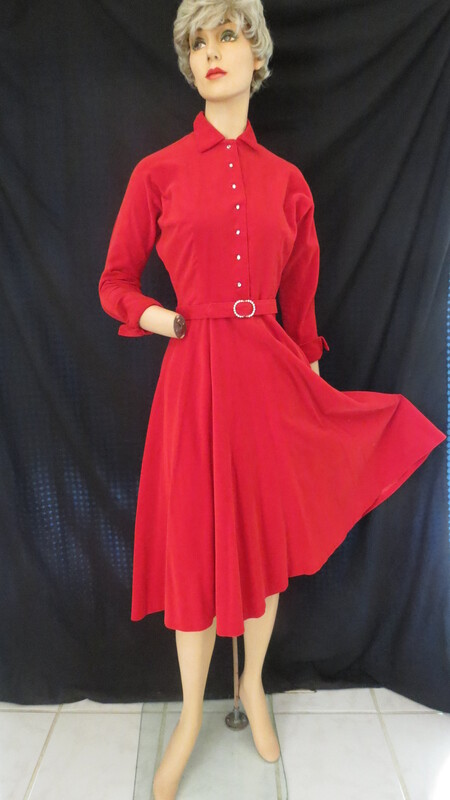 FIREY RED TRUE VINTAGE EARLY 1950’S FROCK . . .
Stella is doing a 1950’s Janet Leigh thing this time (she loves her wigs). 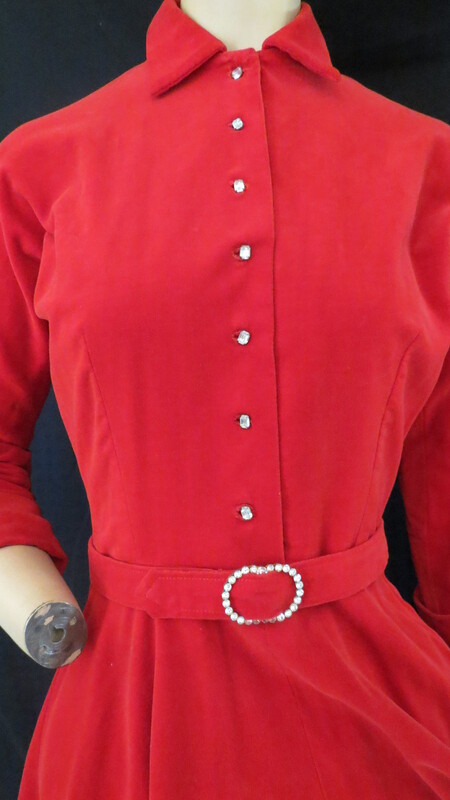 Just perfect in this custom-tailored red velveteen frock with rhinestone buttons and buckle. It’s a little warm for this time of year – probably best for Christmas or Valentine’s Day – but, how could I resist? It’s got those little pointy cuffs on the 3/4/ sleeves that are so stylish, and a very full skirt. No lining or slip needed with this cotton velveteen fabric, as it’s very opaque and will be cuddly in cool weather. The buttons and belt buckle are very nice, too. Would be lovely to still have notions like this available at the corner store . . . . .
Now we’re talkin’! Setting the mood here for Cupid’s Day. Some are relatively demure, but all are beautiful nylon and silk sleepwear from a time when those things were really special. Whether a young girl heading off to college, or a young woman on her honeymoon, one (or two) of these would surely be stowed in her luggage. Madge likes that cute robe with the double button closure at the waist. It would work well over the little short-sleeved gown – perfect for dorm room dreams. As for the silk number in the center, well, it is Valentine’s Day so forget the robe . . . . . . . … . . .. Bored in Miami? Snowbound in your photography studio? How about livening things up with a little vintage cheesecake? Look at those cups on this classic ’50’s Jantzen maillot! If you didn’t have the figure, these suits would do their best to give it to you. I’ll bet you can think of all sorts of ways to pose in this bubblegum pink cutie, and with all the necessary accessories. Snowstorms – That’s why your mother wanted you to learn how to play by yourself. Valentine’s Day – That’s why it’s good to know how to play nice with others . . . . .
Oooh! Wish I had a party to go to – you can be sure I’d wear this. By Jonathan Logan in cherry-color velveteen. Deep V-neck front and back, back zip. The straight sleeves have short zippers at the wrists – a surprise feature that I’ve rarely seen excepting on wedding dresses. Looks good on Madge, huh? You can be sure that there are no pockets! Nothing shows off the figure like a “50s wiggle dress or 1930s bias-cut gown. Women wearing these look nothing but elegant because they are cut and made so well. 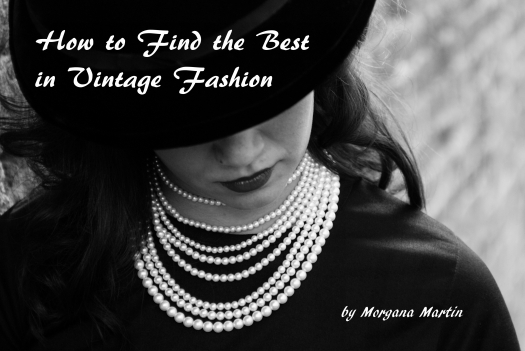 Let’s bring back the days of high-quality, elegant AND alluring clothing again (but till then, I’m thrilled to be the Magicvintagespy. ) And, you just never know . . . . .
OMG – ANOTHER RARE FIND! Too amazing. This time, it’s a Kennedy era cocktail sweater. After 60 years, who would think? You’ll see it tomorrow, and then come wonderful frocks, etc. for St. Valentine’s Day. Stay tuned . .. . . . . . . . . . . . . . . . . . . . . . . . . . .
More mid-century lingerie – this one from the Post-war era in run-proof nylon tricot. By Rogers, it is a quality item and I don’t think I’ve EVER seen this style before! It has no sleeves, and is made to wear as a cape over the shoulders which ties at the neckline. What a pretty way to spend a while over coffee in the morning, or reading in bed when there’s a chill in the air? Pale pink color (the whole thing is prettier in reality than in this photo) and delicate accordian pleating with a ruffle at the neck and wrist areas. Perfect condition, and in my size. What could be better? It’s definitely a keeper. Wonder who wore this beauty in 1950 . . . . . . . . . . . . . . . . . . . .